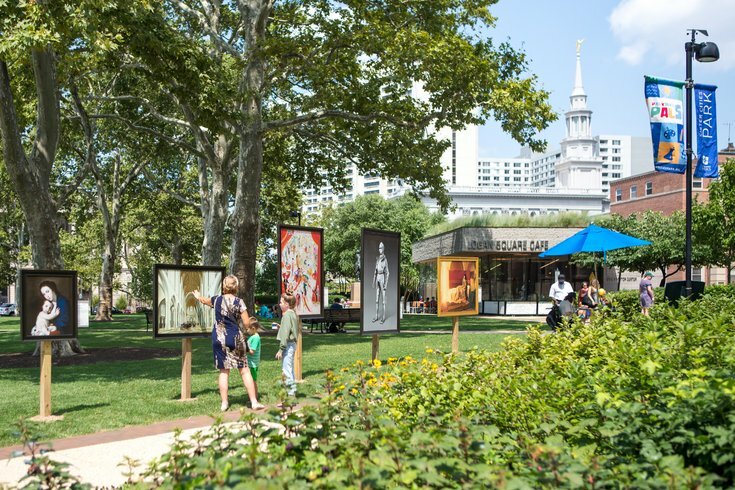 Art on display at Sister Cities Park is part of the Philadelphia Museum of Art's Inside Out program. Sister Cities Park on the Benjamin Franklin Parkway includes grassy space where musicians sometimes perform, a six-foot-tall "amor" sculpture and views of the Free Library, Franklin Institute and Cathedral Basilica. It also has a 10-spout fountain where families can cool off in the summer and the Children's Discovery Garden. Now, there are also paintings from the Philadelphia Museum of Art on view at the park. The museum's Inside Out program brings high-quality reproductions of famous artwork to communities' sidewalks. The artwork on display is listed below. Families will have the opportunity to enjoy the free outdoor gallery through Sunday, Oct. 28.